Roof racking for your car roof is a fantastic option to drastically increase the storage capability of your car. Some vehicles make sacrifices on boot space, and even those with larger boots can struggle on long trips and removals. Wether you’re a tradesman or love going on trips with additions such as hard cases and waterproof bags, you can hold large and bulky items on top of your car with confidence that everything is secure and protected from diverse weather conditions. Cycling equipment is particularly difficult to transport over long distances, especially when transporting valuable bikes with fragile frames that can be damaged on trailers. 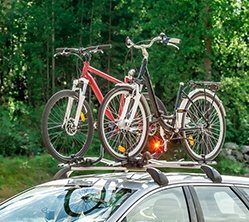 Our racks are perfect for carrying multiple bikes which can be mounted and unpacked quickly and easily. Whether you’re touring a large area, competing in a road race or simply taking the family on holiday, check out our range of bike racks in Melbourne and enjoy our excellent service. With full seat tractability and functionality, you will be restful in the knowledge that your vehicle is fitted with the very best equipment that is on offer in motor vehicle occupancy protection.